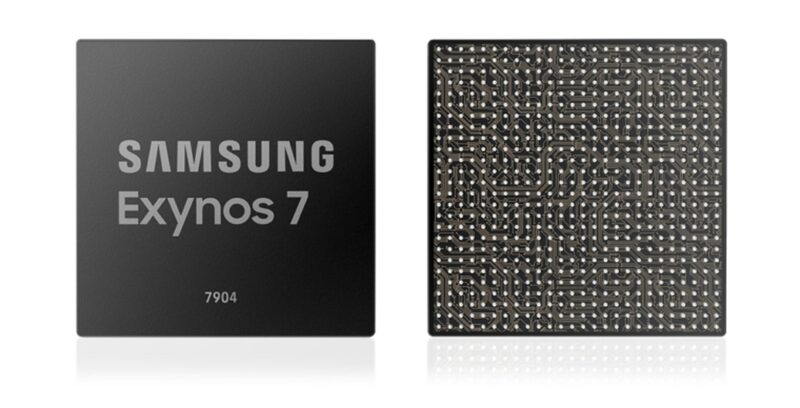 Samsung today announced its latest mid-range mobile chipset, the Exynos 7904. The company says it designed the 7904 specifically with the Indian market in mind. The 14-nanometre, octa-core system-on-a-chip features two high-performance Cortex-A73 cores and six high-efficiency Cortex-A53 cores. The chipset’s image signal processor (ISP), meanwhile, supports a single camera resolution of up to 32-megapixels. It’s also capable of supporting three cameras simultaneously. The ISP can also playback 1080p video at 120 frames per second, as well as 4K video at 30 frames per second. According to Samsung, the 7904’s built-in Cat 12 LTE modem with three-carrier aggregation is capable of theoretical download speeds of up to 600Mbps. The company says its chip foundries are currently mass producing the 7904. With the chipset’s focus on features tailor-made for the Indian market, it’s likely the 7904 will power at least one of Samsung’s new Galaxy M series smartphones. In an interview with Reuters, Samsung senior vice president of product planning and marketing Asim Warsi said the company plans to launch three new Galaxy M series smartphones in India. Set to arrive in other markets later in the year, the Galaxy M series will include features like inductive charging and big batteries. Samsung’s new focus on India is part of the company’s recent plan to restart growth in its smartphone business. Like Apple, the company has seen sales of its high-end smartphones flatline alongside a global downturn in smartphone demand.